to make your world safer. To truly provide quality patient care, a healthcare institution must ensure a safe and secure environment. IntelliCentrics simplifies your privileging, policy compliance and enforcement by providing resources and tools to help facilities make their operations safer. We are the global leaders in assisting hospitals to improve staﬀ, patient and visitor safety by ensuring commercial visitors comply with their policies on safety, duty of care and clinical governance. We are trusted by over 6,500 healthcare facilities to convey and manage acceptance of, their policies, obtain and manage credentials and extend privileges to visitors of all types. As the provider of SEC3URE, the most trusted healthcare policy compliance and enforcement service globally, we pride ourselves on our unparalleled track record of vigilantly assisting hospitals to improve the health and safety of their patients and staﬀ. As a security company with 20 years of experience and the provider of the SEC3URE™ service, IntelliCentrics is uniquely qualified to help hospitals manage the safety and policy compliant access of all of their visitors. Over 6,500 healthcare facilities already trust IntelliCentrics to fulfill this, managing over 450,000 commercial visitors. As providers of state-of-the-art security technology, with numerous industry firsts to our name, we continue to lead the industry in delivering forward looking security solutions for our customers. Securing a hospital by locking all the doors is not an option, but that doesn’t mean you shouldn’t know, and easily manage, everyone who enters. With SEC3URE, you can apply your policies universally to all those working in or visiting your hospital. Just leave the infrastructure, technology, administration, credentialing, and monitoring up to us. Learn how LDS Hospital, Ellis Hospital and The Nebraska Medical Center utilized vendor credentialing to improve patient safety. IntelliCentrics Solutions Canada Announces Acquisition of Vendorlink.ca, Canada’s leading vendor management solution. 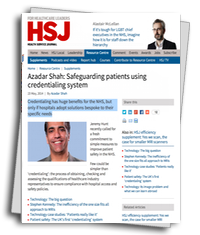 Credentialing has huge benefits for the NHS and private groups, but only if hospitals adopt solutions bespoke to their specific needs. The cost of credentialing is significant, but not credentialing could cost your hospital even more. Download the white paper to find out why. Risky Business? Can Your Hospital Afford Not to Have a Credentialing Program? 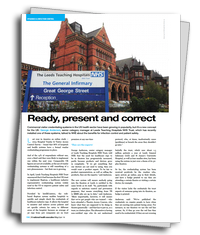 A comprehensive credentialing program costs an average-sized hospital £600,000 a year. However, the cost of NOT credentialing can be five times as great. Download the infographic to learn more. For the 30% of members for whom the no-charge Base Subscription does not suffice, a single annual subscription fee (if applicable) covers the member for all IntelliCentrics-enabled facilities globally. There are no additional charges.